The pope takes a T-shirt from a young man and kisses a baby as he walks through the Varginha slum in the southern part of Rio. The pope is receiving several gifts from slum residents as he makes his way to the soccer field where he'll give a speech: T-shirts, knicknacks and a scarf of his favorite Argentine soccer team San Lorenzo. After visiting the chapel in the Varginha slum, Pope Francis walked through the streets between barricades but repeatedly moved to the side and came into close contact with the faithful. Only a modest security detail is protecting him. 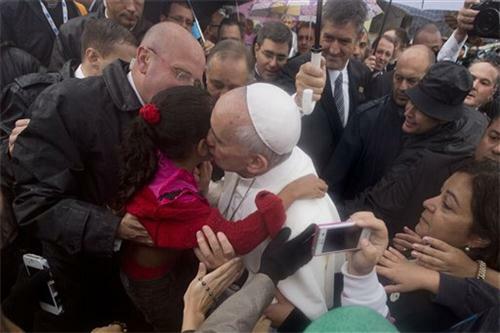 The crowd erupted in pandemonium when the pope approached the barricades to kiss a baby or touch a child's head. Many broke into tears when the pope approached or touched them. 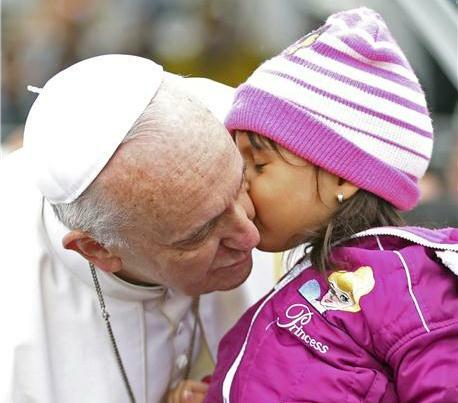 "Fearless Francis," as some have called the pontiff, is making good on his name. He looks 100 percent comfortable walking through the Varginha slum as multitudes of faithful press up against metal barricades lining his path. We'll have the video shortly. 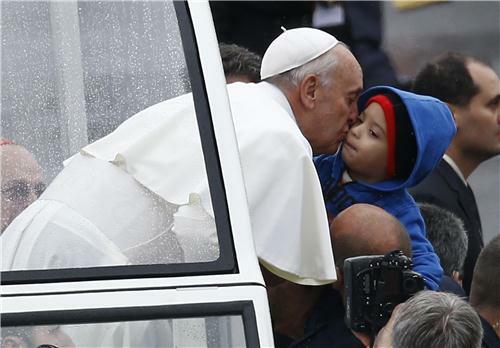 Francis is continuing his baby-kissing ways. He must have kissed 30 babies in the last 20 minutes. Getting swarmed by a crowd is just another day at the office for Pope Francis. 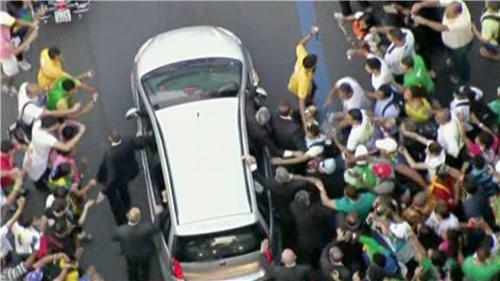 Just like today, when his vehicle was surrounded by a crowd in a Rio slum, the pope encountered more than a few energetic Brazilians up close when he first arrived in the country on Monday. A wrong turn sent a humble Fiat carrying Pope Francis into the thick of a frenzied Rio crowd Monday, in his first minutes back in South America since becoming pontiff. It was a nightmare for security officials, but for the clearly delighted pope just another opportunity to connect. Francis, it seems, couldn't have been happier -- he rolled down his window to say hi to the gathering crowd, and even managed to kiss a baby who was handed to him. We told you earlier about how comfortable Francis looked walking through the slum. Francis has taken to a stage set up inside a community soccer field in the slum. The adoring crowd is about 20 feet below him. 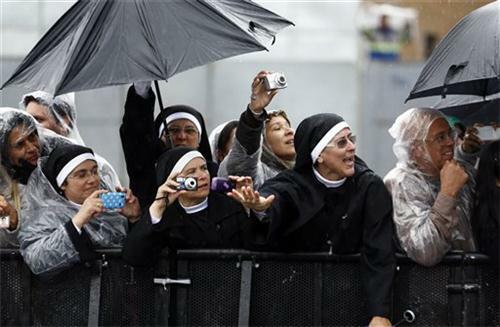 The thousands of Argentines packing Rio's main cathedral just erupted in applause as the president of Argentina's bishops' conference told the pope that these young people had waited all night in the rain for this moment to see him. What is it I want? I want you to go outside, to bring the church to the street! If you don't go out, the church becomes an NGO. And I do NOT want the church to be an NGO! More than 30,000 Argentines make up the largest foreign contingent attending the World Youth Day events. The pope's manner of speaking to the Argentines inside Rio's main cathedral is clear and direct, and brimming with good humor, like any close friend or uncle would talk when sharing advice to a loved one. Example: "Don't blend your faith," he says - "...there are smoothies made of oranges, strawberry smoothies, banana smoothies, but please! Don't mix your beliefs!" 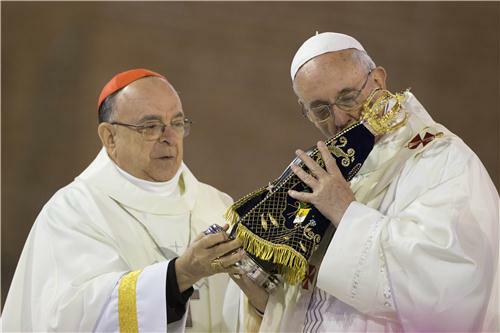 Pope Francis drew a sign of the cross and touched a symbol of Marian devotion that is closer to the heart of all Catholic Argentines -- the Virgin of Lujan. Dressed in robes of Argentine white and blue, the statue was carried to Brazil by the Argentine delegation to be blessed by their pope. The pope tells Argentines gathered in Rio's main cathedral that he's sorry he can't be closer to them, referring to metal barriers separating him from the faithful. "I wish you weren't caged like that, but it was necessary -- it's an organizational thing," he said. "Sometimes, I also also feel caged in." Francis, a pontiff with the common touch who loves crowds, was at his most animated, speaking in his native Spanish before the massive group. You've probably heard about the world-class soccer players and beaches, but what else do you know about Brazil? Let us fill in some of the blanks. "You are often disappointed by facts that speak of corruption on the part of people who put their own interests before the common good. To you and all, I repeat: Never yield to discouragement, do not lose trust, do not allow your hope to be extinguished. Situations can change, people can change." Pope Francis received keys to Rio this morning as he greeted people at the City Palace. --Victoria Chochen, a 16-year-old Argentine student, outside Rio de Janeiro cathedral where pope Francis met with Argentines. Hundreds could not get in. The pope is in Brazil for World Youth Day, an event held roughly every three years that brings together young pilgrims from across the globe. • Organizers have 4 million communion wafers on hand. 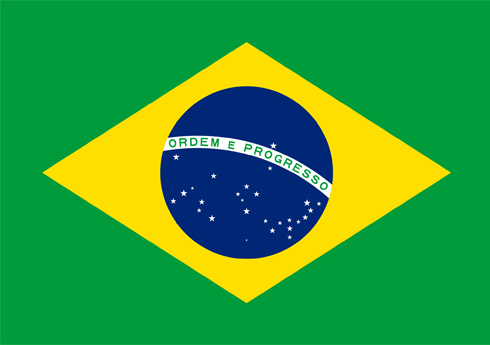 • There are 355,000 pilgrims from 175 nations in Brazil. The vast majority -- 220,000 -- are from Brazil; 23,000 are from Argentina; 10,800 are from the United States; and China came in at No. 4 with 9,200 faithful. • Catechesis, or religious instructions, is being held in 25 languages. • There are 60,000 volunteers helping out with the event. • The stage on Copacabana beach is 40,900 square feet and the area of the altar sits 26 feet above the white sands. A cross at the rear of the stage is nearly 56 feet tall. • There are screens measuring 200 feet by 49 feet on the sands of the crescent-shaped beach and 26 speaker towers. The pope's visit to Brazil has generated an ad hoc industry manufacturing trinkets and other memorabilia, including thousands of rubber face masks. Pope Francis has been pontiff for little more than four months, but he already has some signature phrases. "Oh, how I would like a church which is poor and for the poor!" -- remarks to reporters just after his election, March 16. 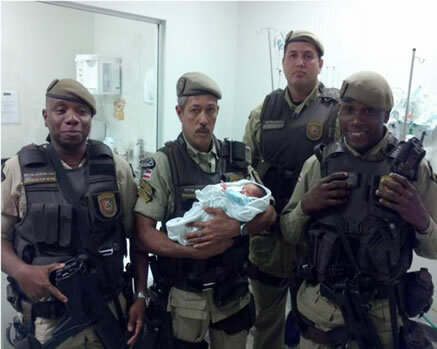 Brazilian military police agents rescued a baby found in a shoe box in the northern city of Salvador, Bahia on Tuesday night. 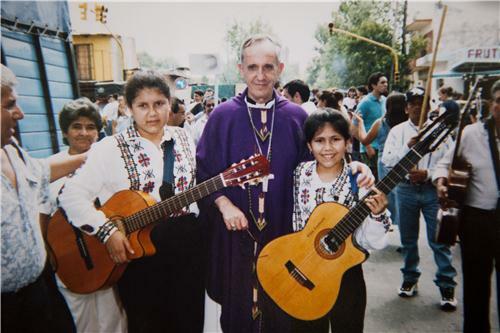 They took him to a local hospital where doctors and police have suggested naming him Francisco after the popular pope. Pope Francis left the bulletproof popemobile at home. Instead, he's zooming around in the same open-topped car he uses at St. Peter's Square. Popes have traditionally used the protected popemobile, with its raised seat and panoramic, bulletproof windows, for travels outside Rome. But Francis likes to break Vatican protocol to connect with ordinary people. To get around the Vatican he uses a Ford Focus. Francis recently blasted priests who drive fancy cars and visited the Vatican garage to check out the fleet of Vatican vehicles to see if they were humble enough. Francis is a big environmentalist like his predecessor, but perhaps he’s ahead of his time: car manufacturers have yet to come up with an electric popemobile. Pope Francis, who's blessed the Olympic flag and met some Olympians during his visit to Brazil, isn't the first pontiff to show his admiration for the games -- or sports in general. Pope John Paul II spoke out frequently about the benefit that sports can bring to society. 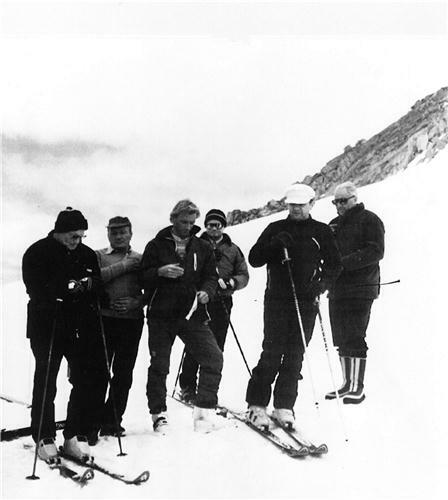 And he was an avid skier himself -- this is a shot of the pontiff on a mountain in Northern Italy, making the sign of the cross with fellow skiers on July 17, 1984. That's him on the far left. 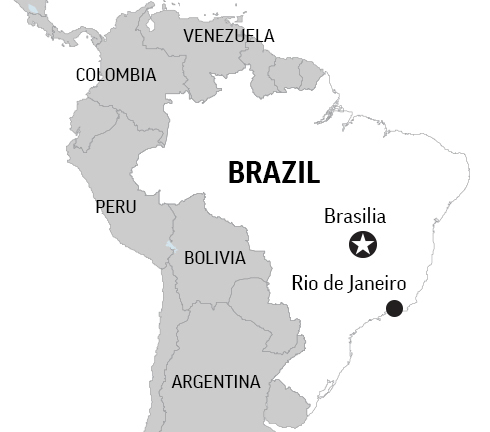 A native of Argentina, Pope Francis is the first pope from Latin America, making his Brazil visit akin to a homecoming. Argentina is sending one of the biggest groups of pilgrims to the event. Back home in Buenos Aires -- where Pope Francis was born, raised and rose to lead the Argentine church -- huge screens have been put up in several plazas for people to follow along. • Pope John Paul II: John Paul was the first pope to visit Brazil, arriving in the summer of 1980 and returning once more during his pontificate, in 1997.On both trips, he visited Rio slums, or favelas. • Pope Benedict XVI: Benedict was 80 years old when he visited Brazil in 2007. He emphasized Catholic moral values as the answer to Latin America's social and economic problems, and canonized Brazil’s first native-born saint, Friar Antonio de Sant'Anna Galvao. 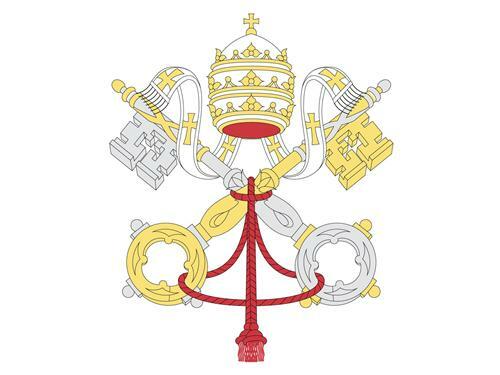 • Pope Francis: Brazil is the first international trip for Pope Francis. world was in need of a "cathartic" change to keep from spiraling into a profession dominated by money and drugs. A tweet from the @Pontifex Twitter account today extended the theme of sports as a positive force. 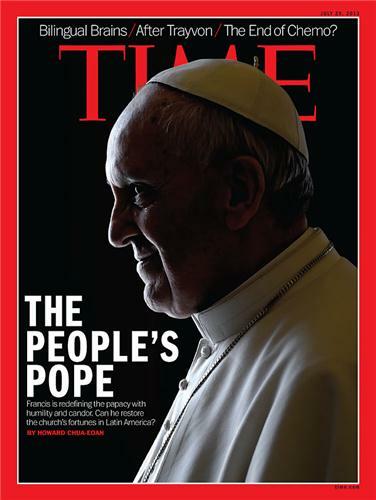 A photo of Francis in Time's international edition for July 29 is stirring controversy even before it goes to print. Many are venting anger on social media saying the Pope is being shown like the devil because the 'M' in the magazine's name cuts his image and two red horns or spikes seem to poke up from the Pope's head. It's the million-dollar question during Francis' first trip to the region's biggest nation and the home of the largest population of Catholics in the world. Much like Francis' trip to Brazil, a visit by Pope Benedict XVI to Britain in 2010 was influenced by the country's then-upcoming Summer Games. He launched the London-based John Paul II Foundation for Sport, creating a charity that aims to "build spiritual character through excellence in sporting skills and fitness." When the CEO of the charity, Monsignor Vladimir Felzman, formally introduced it a year later, he put his muscles where his mouth was. He delivered a speech on the interconnectedness of physical, intellectual, emotional and spiritual growth while doing 75 pushups. Pope Francis kisses a girl while visiting the Varginha favela in Rio. 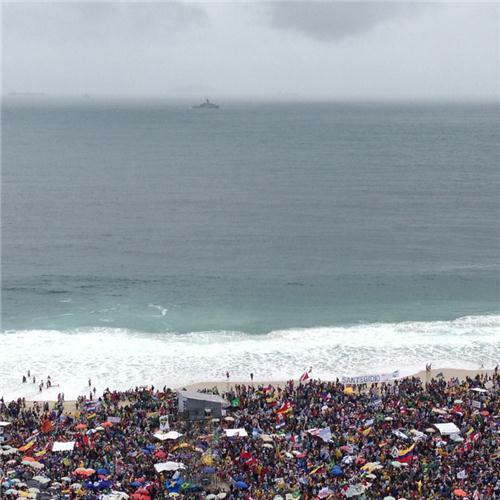 Thousands of people are braving both cold and rain at Rio's famous Copacabana beach as they wait for the welcoming ceremony of the World Youth Day festivities to see Pope Francis. Some were chanting "This is the youth of the Pope!" "It doesn't matter, we will starve." "It will stop when Francis arrives." -- Argentine pilgrim Diego Palacios of the rain in Copacabana. Coming soon: A video of pilgrims waiting at Copacabana. Francis brought his personal history to today's visit of one of Rio de Janeiro’s shantytowns, once controlled by drug lords. As archbishop of Buenos Aires, then-Cardinal Jorge Mario Bergoglio frequently preached in the poorest "misery villages" in Argentina’s capital. He sponsored carpentry classes, consoled single mothers and washed the feet of recovering drug addicts. The pope’s presence was more than a blessing for residents of the slum the pontiff visited this morning. It was good business, too. Residents with humble hillside homes near the church the pope visited or along the path he walked were charging up to $500 for people to get a bird’s-eye view of his holiness. Organizers expect up to 2 million people to welcome the pontiff for a 5 p.m. event that will include a prayer service and musical acts. 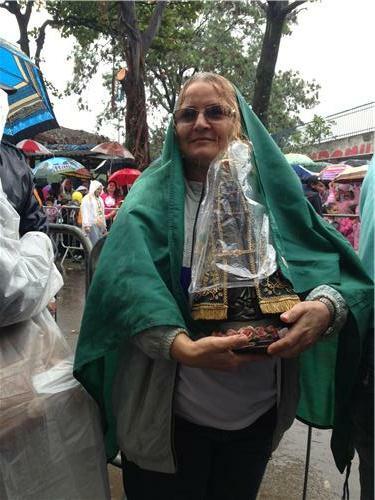 Even the Virgin needs a rain slicker. Will the final Mass be a washout? Rumors are flying fast and furious in the Brazilian press, as we noted previously, that the Sunday Mass that’s supposed to be celebrated by the pope in a remote field about 30 miles west of Copacabana will be moved to the beach because of all the rain that’s fallen on Rio. The pope is scheduled to visit the area known as Guaratiba on Saturday night for a prayer vigil and then celebrate a Sunday morning Mass. But knee-deep mud around the stage is raising doubts about how wise it would be to have more than 1 million faithful head out there. "There's a clear surge in faith in the South. ... Devotion is very strong." Marco Sibaja, AP reporter based in Brasilia, caught up with Mims as he got coffee in Copacabana while on his way to Pope Francis' encounter with pilgrims attending World Youth Day. A top Brazilian newspaper says that a Sunday Mass that Pope Francis will celebrate has been moved from a rural countryside location 30 miles west of Rio de Janeiro to Copacabana beach. That's because non-stop rain the last few days turned the rural site into a giant pit of knee-deep mud. The O Globo newspaper says it confirmed information of the move with the archbishop of Rio de Janeiro, Orani Tempesta. 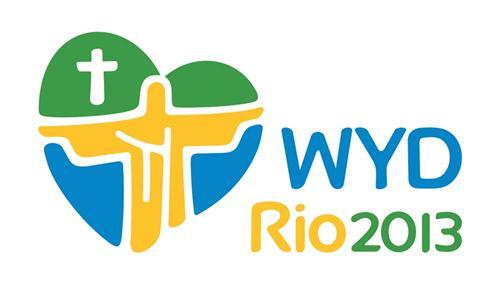 Organizers of the World Youth Day event say they have no information on the change. ﻿Vatican spokesman Rev. Federico Lombardi confirms that a Mass Pope Francis will celebrate on Sunday has been moved from a rural countryside outside Rio to Copacabana beach. An area equivalent to seven football fields was cleared to accommodate the venue where the pontiff was scheduled to hold his largest Mass Sunday. The Mass has been moved to Copacabana beach. The area was so large that organizers had to manufacture the 4,673 portable toilets to accommodate the hundreds of thousands that would have attended. There were not enough portable toilets in the country available. 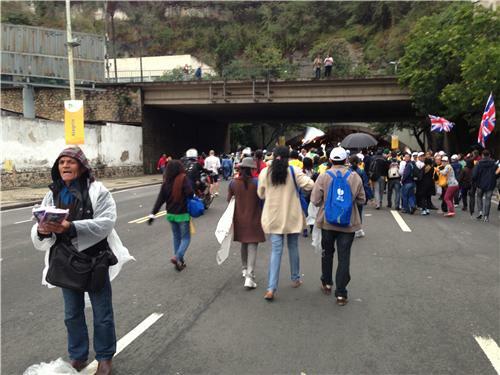 With roads to Copacabana closed to traffic, thousands of people streamed to the beach on foot.